At El Cozumeleno Beach Resort the facilities and amenities are perfectly oriented for the perfect family vacation, the ideal wedding or honeymoon. Room Service 7:00 A.M. - 11:00 P.M.
Free Honeymoon Package: One bottle of sparkling wine in the room. Honeymoon Package must be requested at time of booking and guests must present wedding certificate (no longer than three months) at time of check-in. Amenities: All rooms feature a garden view from a private balcony or ground floor patio with two chairs and a cocktail table. Bedding includes either one king bed or two double beds. Other features include cable TV, air conditioning, telephone, two chair dining set inside, and a stall shower. Amenities: All rooms feature an oceanfront private balcony or ground floor patio with two chairs and a cocktail table. Bedding includes either one king bed or two double beds. Other features include complimentary Wi-Fi, cable TV, air conditioning, telephone, two chair dining set inside, and a stall shower. Amenities: This room is located on the Ninth floor with an oceanfront private balcony with two chairs and a cocktail table. Bedding includes either one king bed or two double beds. Other features include cable TV, air conditioning, telephone, two chair dining set inside, and a stall shower. Amenities: Rooms are located on the 9th floor, south tower. Included: courtesy local calls, guaranteed reservation in specialty restaurant, room service, nightly courtesy, mini refrigerator (no product), pool towels in room. Amenities: This room features preferred reservations at the La Veranda Restaurant, personalized Guest service, turn-down service and four beach towels. Bedding includes either one king bed or two double beds. There is a minibar that includes sodas, beer, and purified water which is restocked daily. The living room features a two chair dining set. Other features include cable TV, air conditioning, telephone and a stall shower. Please Note: This room is for adults only. Children are not permitted. Amenities: All rooms feature an ocean view private balcony or ground floor patio with two chairs and a cocktail table. Bedding includes either one king bed or two double beds. Other features include complimentary Wi-Fi, cable TV, air conditioning, telephone, two chair dining set inside, and a stall shower. Amenities: In addition to free transportation to and from the event on race day, Guests also have access to a mechanical bike service (only Iron Man race), a specially designed athletes` buffet, a secure running path, a map of cycling routes in Cozumel, and tours and activities for the racers family. In-room massage and free bottled water are also available. Renting this room requires proof of registration in the Iron Man race and/or the race event. El Cozumeleno Beach Resort is located on a powder white sandy beach on the northern Hotel Zone of Isla Cozumel, facing the crystal waters of the Mexican Caribbean. This elegant all-inclusive resort is only six miles/four km from downtown and the shopping district. At El Cozumeleno Beach Resort, you can have it all in the same spot. The facilities and amenities are perfectly oriented for the perfect family vacation, the ideal wedding or honeymoon. Caribbean design, style, and atmosphere surround the El Cozumeleno Beach Resort, which contains 251 Guestrooms in two towers. The resort offers many activities that include live shows produced by the activity/entertainment staff that include live night shows at the resort`s open-air theater or at the beach, a casino night at the snack bar, or a night movie projection. If it is a mental challenge you seek, a lovely plaza next to the south pool contains a colorful ceramic fountain, with a giant black-and-white chess set with pieces the size of third graders. While vacationing, Guests can also stay connected through the complimentary Wi-Fi in all public areas of the resort. 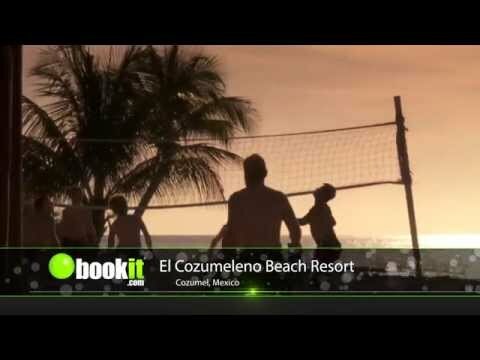 El Cozumeleno Beach Resort has been a favorite among Athletes during different annual sporting events. The resort`s facilities allow professional and amateur high-performance training. Features include mechanical service and transportation for Ironman and 70.3 events, specially-designed buffets and special training rates for athletes all year long. Here you can find romance, excitement, or relaxation all in the same day. In addition, you can relax in one of 251 beautifully decorated, over-sized Guestrooms. Each of the rooms features one kind bed or two double beds, amazing views and breathtaking sunsets. El Cozumeleno Beach Resort has been recognized for many years as the preferred spot for couples, honeymooners, water sports enthusiasts and of course for the entire family. La Veranda: Elegant Dining at the La Veranda Restaurant, Open from 6:00 P.M. - 10:00 P.M. La Veranda Serves Gourmet a La Carte Cuisine. Advance Reservations Are Required. Dress Code: Long Pants, Sleeved Shirts, Closed Shoes or Formal Sandals for Men. No Shorts or Beach Sandals for Women. Snack Bar: Enjoy the Relaxing Atmosphere at the Poolside Snack Bar, Serving National and International Brand Drinks as Well as Snacks Throughout the Day. El Cocal Restaurant: Take in an Extraordinary View of the Caribbean While Dining at El Cocal Restaurant, Serving Breakfast, Lunch and Dinner Buffets. A La Carte Dining Is Also Available for Lunch and Dinner. If You Feel like Dining in, Room Service Is Available Without Extra Charge from 7:00 A.M. - 11:00 P.M. Afternoon Cocktails Are Served at the Lobby Bar from 6:00 P.M. - Midnight. Here You Can Watch Your Favorite Sports or Just Relax. If you are seeking a special place to celebrate your romantic commitment, El Cozumeleno Beach Resort offers incredible sunset weddings and unforgettable romantic honeymoons, so you can forever remember this special time spent beside the rainbow colors of the Caribbean. Across the street is a Nicklaus Design Group PGA Golf Course where you can enjoy world-class golf. Just two minutes from El Cozumeleno Beach Resort, golfers will find the rustic-looking, native palapa-style club house. Plus, Guests of El Cozumeleno receive a special discount on green fees. Enjoy endless activities to further enhance your vacation experience. The resort offers snorkeling lessons, introductory scuba diving lessons, bicycle tours, kayaking, aquaerobics and beach volleyball at no extra charge. At the dive shop, you can arrange different activities such as scuba diving tours, deep sea fishing, jet skis, and parasailing (all at an additional cost). In addition, all Guests receive a 40% discount on green fees at Cozumel Country Club Golf Course located across the street. Take Note: Like most Cozumel hotels, the El Cozumeleno recommends against drinking the tap water and supplies bottled water instead. Cozumel Island is a very special and unique place due to its many unparalleled natural beauties. In order to preserve and maintain our Islands delicate ecological balance, starting February 4th. of 2019 an Environmental Fee of $5usd will be charged per room per night, upon guest arrival to our Hotel Premises. This fee includes a city tax plus a resort fee. Client important contribution will help us care for our beaches, reefs, fauna, etc. So that we may keep them beautiful for their next visit and most importantly, for many more generations to enjoy.